Twirling the star is an annual tradition honored at SCF. In some Aleut regions, the traditional song Many Years is often greeted with a rifle salute. In some Yup’ik regions, everyone is treated to a lavish three-course meal, with the Elders and church functionaries dining first. In some households, adults are presented with small gifts. In other Yup’ik areas, each household presents their major annual contribution to the parish. Christmas in Russia is normally celebrated on Jan. 7. The Russian Santa Claus is named Ded Moroz, or Father Frost. He is accompanied by Snegurochka, the snow maiden. He brings presents to children to place under the New Year’s tree. He carries a staff, wears valenki (felt boots), and is carried across Russia in a troika (a vehicle led by three horses). The common decorations of Orthodox Christmas are a decorated fir tree, a star (such as the first star in the sky or the star on top of the Christmas tree) and a nativity scene is usually the center piece of the star. 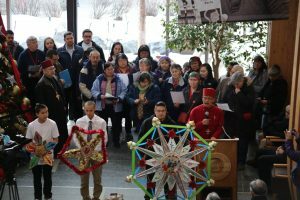 Another uniquely Alaskan tradition of Russian Christmas, and one we celebrate at SCF is starring, where a large star ornament is twirled as the choir sings. The star is said to be the one the three wise men followed to Bethlehem. Carolers follow the star as they travel home-to-home and sometimes village-to-village. The practice of starring is believed to have come from the Carpathian Mountains in the Ukraine.